It's good to note that the old Audio Editor Express has continued development under a different name and is now offered by DansDansMedia. Audio Editor Express allows users to edit audio files in a number of ways and can eventually burn all of your projects to a CD or DVD file. The program was designed especially for beginners who want to get their feet wet editing music; It includes visual representations of your audio projects and can record music, apply interesting effects to audio and apply filters. Audio Editor Express also functions as a audio conversion utility which can convert between many different audio formats (actually, the list is very long). 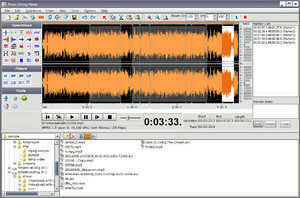 Music Editing Master 11.6.3 is a shareware program and can be used as a demo to try the software until the free trial period has ended. A full version of the program is available after the trial period ends. For security reasons, you should also check out the Music Editing Master download at LO4D.com which includes virus and malware tests. Additional screenshots of this application download may be available, too. 4.85 out of 5 based on 13 ratings. Audio Editor Express has a presence on social networks.